A few months ago, my husband and I went on a quest to find a new mattress. We knew right away that we just didn’t want to buy any mattress from a big box store. We wanted something natural, firmer than an original mattress, made better than the conventional mattresses and we wanted to make sure we could try it out. Mattresses tend to absorb dust, mites, skin cells and other bacteria over time. I know this sounds gross, but it’s true. Imagine wearing a shirt 8 hours a day for 10 years without washing it, it gets filthy. I have to be honest here but I have never washed my mattress, maybe vacuumed once or twice during its lifetime. It always had one of those cover sheets, plus a regular sheet, but it never went through that kind of deep cleaning. What happens over time with all of the stuff it absorbs is that the mattress gets heavy which is also what happened. My original mattress was bought at what was once Sleepy’s. It is conventionally made so it contains whatever was allowed by law at that time. This means it contained fire retardant material, plastic, synthetic materials, springs, non-organic materials, etc. Not all good and the problem is that many of these substances release chemicals over time in a process called off-gassing. Can you imagine being exposed to these nasty chemicals 8 hours a night for 10 years. Not good at all. My original mattress was also just worn out over time. We started drifting and sinking towards the middle which became annoyingly frustrating. We had no back support or any other support for our body because we were just sinking into it. Sometimes this plush feeling is great, but over time it gets troublesome as your body ages. By coincidence during our search, my husband was a big listener of Ben Greenfield and found an article he wrote “Is your mattress killing you?” and it provided us the insight to look and search for an organic mattress that was made of all natural materials, made locally (as possible) and contained no extra chemicals or other nastiness. Our other criteria was we wanted to be able to touch, feel and get on the mattress. We only had two options at the time since the others were mostly online orders with the very popular out-of-the-box mattress. I just couldn’t see myself buying a mattress without trying it on. I know you can return those, but for the hassle, I wasn’t convinced. Amazon had some pretty inexpensive mattresses too, but I’m now very weary of buying from Amazon with doctored or paid for reviews, items being warehoused with fake stuff, it just didn’t sit well with me. This is where we arrived at Essentia. We visited it’s showroom in New York Cityon 34th Street by Macy’s as well as another showroom as part of home design studio/decor place in Chelsea. Thankfully at the 34th Street location, the showroom is upstairs and away from the bustle of the street so it was very quiet and we were the only ones there so had plenty of time to try it all out. We visited on two separate occasions, tested out all options, spoke with the reps and found the one that we liked. We ordered and eagerly awaited our new mattress. Essentia mattresses are made-to-order which meant we had to wait 4 weeks to get ours. This review has been independently completed. No compensation has been received from the manufacturer of this product. Essentia mattress is handmade in a sweatshop free facility in Canada. Essentia is advertised as the “Worlds Only Natural Memory Foam Mattress”. Their goal was to create a mattress that was good for the body and good for the planet. Essential mattresses are made of natural memory foam from the hevea milk of rubber tree saps. No petroleum based foams are used in their products. Note that as much as 15% petroleum based foam can be used and still be termed “organic” or “all natural” for conventionally made mattresses. Essentia mattresses have been tested and certified to have to VOC (volatile organic compound) off-gassing. The mattress is also not sprayed with fire retardant material, formaldehyde or other compounds to keep it cool. We ended up selecting the Classic 8 Mattress. We tried a few of them and compromised on this. I wanted a softer one, my husband wanted a firmer mattress. Now, I don’t roll into the middle which is a huge plus given our old mattress was so misshapen. We also opted for the Classic pillows as part of the promo deal. Each mattress comes with an organic cotton cover that you can remove to wash and clean every few months. Essentia mattresses are Made in Canada and are made to order from what we gathered. We waited 4 weeks for ours to be completed and delivered. I checked in midway and the rep said our order was still in the process of curing. I wanted to learn more about their manufacturing process and read that their workers don’t even need to wear protective gear. That’s a plus because the sad truth is that most mattresses are made with sweatshop labor. Essentia mattresses are delivered roll packed so they are compressed to reduce size which means less truck space and less packaging. Upon opening it, it unrolled pretty quickly. The mattress was wrapped in one large heavy duty plastic wrap which I recycled over at Home Depot’s recycling center. The box was stapled together and no plastic tape (reinforced threaded paper tape) was used which was pretty impressive given how large and how heavy the item was. The paper box was recycled. The boxes are made from 100% recycled paper (99% post-consumer, 1% post-industrial). I also ordered the pillows with it and those came wrapped in nothing but 1 tissue paper and the paper box. No extra packaging excess which was nice. I reused the box to store stuff in because it was just the right rectangle size and had a nice lid. Original price was $ 3295. Final price was $2636 with a discount. They run promotions during major holidays so I started tracking them on Instagram and got the promo I was looking for. Initial price seems like a shock but think about how long you keep a mattress, how much use it gets and how often you are exposed to it. Currently on their website, essentia.com. This is how I bought it, but we tested it out at their showroom in New York City (by Herald Square) and at a design store in Chelsea (which I can’t remember the name). The reps at both places were very knowledgeable. We had read up on it and they didn’t B.S. us. Even though this mattress is new, I had to start thinking about how to dispose of it. We just recently went through a process of liquidating everything from my childhood home and that included throwing away mattresses that were used for 23 years. The sad reality is that these mattresses were put in a curb to be picked up by sanitation. Mattresses can be made up of so many materials: wood, springs, natural foam, synthetic foam, cotton, polyester, etc. that it’s hard to separate and recycle each component. I learned that Essentia mattresses can decompose within 3 years if left to the elements. Isn’t that crazy? I mean I’m not about to leave my mattress outside, but that is good to know and maybe if I have a big piece of land, I can do that experiment years from now. Essentia does have a 60 Day Guarantee Policy. They will accept returns only after you’ve tried the mattress for at least 30 days. They charge a fee of 9% of the listing price for transportation processing and recycling. I had also read somewhere that they actually recycle the product instead of what other companies do where they spray it with chemicals so that the next customer can use it. Food for thought the next time you buy a “cheaper” mattress because it was returned. I think a mattress and underwear are two things I will refuse to buy secondhand at this point. The box for the Essentia pillows made of recycled and recyclable cardboard. With paper tape. The inside of the Essentia pillow box. No plastic. Just a tissue paper wrapped around the pillow. Rolled up Essentia mattress with paper tape and reinforced with heavy-duty-staples. 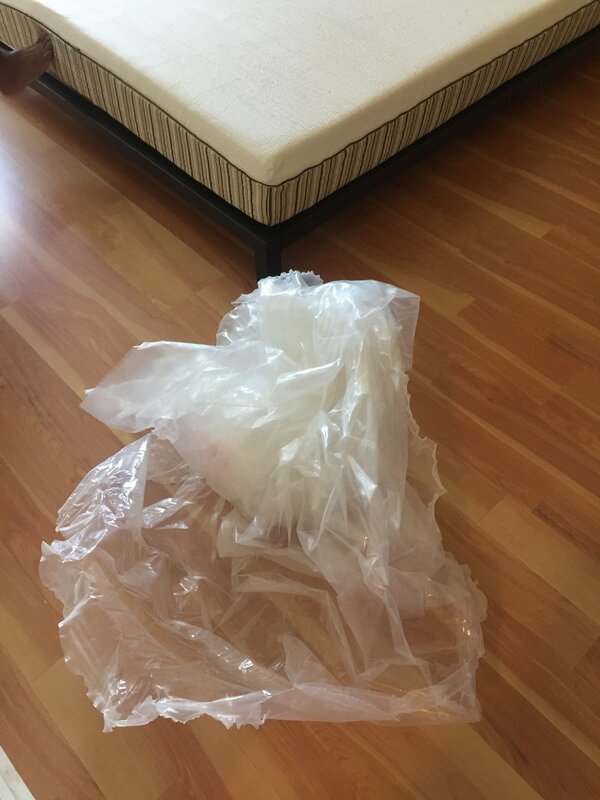 Plastic which covered the Essentia mattress. So we have been sleeping on this mattress for over 90 days now. We are very happy with how it holds up to both of our weights. It definitely took some time for me to get used to the firmness. I was used to just sinking in the middle. No back pain or other pain for either of us. My husband just finished his first half tri a few weeks back and was able to recover pretty fast sleeping on this. Not sure if it was the bed, but I believe that played a part because his sleeping cycle were pretty even. We didn’t detect a smell even from the first time we opened it. Pillows take some time to get used to as well since these are also pretty firm, but we’ve kept the pillow situation simple and just used one each which keeps the bed clear. So far temperature on the bed has been good. No major issues overheating but I run cold so there’s that. I haven’t had to remove the cover yet so let’s see how that goes when I wash it a few months from now. Have you bought a bed lately? What was your criteria for choosing one? Our Essentia mattress. It sits low to the ground.